PDP seem to have struck a balance between quality, affordability and quantity with the X7 kit. The individual components sit well together and perform at a similar standard, with no glaring weak links. The use of poplar rather than a more 'regular' wood for the shells might give some pause for thought, but there is more to a kit than its type of wood. Sonically and visually this kit is a complete, thought-through package. Includes DW’s RIMS-type mounts. Value for money. Comes with a surprisingly excellent-sounding snare drum. Poplar wood shells may not be to every drummer's taste. Paciﬁc Drums and Percussion, or PDP as it is more snappily known, is an offshoot company of Californian drum wizards DW. Since its inception at the turn of the millennium, PDP has established a solid reputation for producing reasonably priced drums that incorporate DW's expertise and ﬂair. This X7 drum kit ﬁnds PDP attempting to have the last word in the 'how big a kit of quality can you ﬁnd on a budget?' debate. The kit boasts seven drums - three toms, two ﬂoor toms, a snare and a bass drum - comes with a complete hardware pack and is available in a choice of six sparkle lacquers, yet retails at little more than a mid-range ﬁve-piece kit. On paper, it's an impressive feat. Seven is a number that crops up all over the place - did we mention days of the week or James Bond? - and there is something oddly familiar about the prospect of a seven-piece kit, even to those of us who have never actually owned that many drums. The X7 kit consists of a 22"x18" bass drum and 14"x5" snare, along with 8"x7", 10"x8" and 12"x9" toms, and 14"x12" and 16"x14" ﬂoor toms. The drums are manufactured almost entirely from poplar, with only a single outer layer of birch ply on each drum preventing complete poplar homogeny. Poplar is an abundant hardwood that is relatively inexpensive. It has been used widely in the past as a part of composite wood shells, but it is only fairly recently that drum makers have begun using poplar as a primary ingredient for shells. The affordability of poplar doubtless inﬂuenced PDP's choice as this kit was, from the off, intended to be ultra-competitive. The decision to outsource the construction of the kit to PDP's Chinese partnership was reached via the same criteria and, again, it has ensured that the kit has come in on-price. The drums themselves are of the usual Paciﬁc standard, with only the country of manufacture (which is, inevitably, stamped on the boxes) giving any hint of their origin. Particularly impressive is the fact that all the toms, including the ﬂoor toms, are FAST-sized ('Fundamentally Accurate Sized Toms', so shorter in depth than regular drums), so they share the same proportions as toms costing many times more. The three rack toms are also equipped with STM mounts - DW's RIMS-type non-penetrative tom mounts, again a pro feature that is a sign of a welcome emphasis on quality. The lugs are PDP's now familiar oval models, which echo the round turrets found on DW drums. With a set of drums this big occupying the price point it does, you'd be forgiven for expecting the ﬁnish to take the form of a wrap or plain lacquer at most. Instead, PDP has somehow managed to offer a variety of dazzling look-at-me sparkle lacquers. PDP's UK distributor, Morico, holds two of the lacquer choices in stock (Orange Sparkle and Silver to Black Sparkle Fade), but all four other options can be ordered directly by your PDP dealer. The example on the review kit - Gold to Black Sparkle Fade - is impressive, giving the kit an arresting appearance. The alternative ﬁnishes look equally striking. True-Pitch tuning rods are ﬁtted across the kit. Another drop-down feature from DW, the ﬁne threads they possess offer sensitive and hold-steady tuning possibilities. 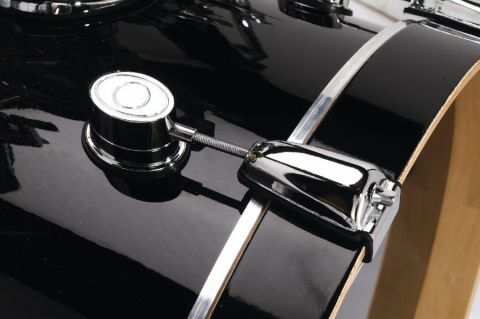 The bass drum claws, meanwhile, are another great detail, being thoroughly lined with rubber to prevent them damaging the wooden bass drum hoops. A hardware pack made up of 800-series stands ('medium duty' according to PDP) is included in the price. Featuring a snare stand, hi-hat stand, two cymbal stands (one upright, one boom-arm) and a bass drum pedal, their build quality suggests that they will be around for as long as you're still playing. As the X7 kit has been devised as a complete package, no individual drums are available separately. This isn't a problem where the toms are concerned, but if you wanted to turn your X7 into an X8 by adding another bass drum, for instance, it could be a little frustrating. With all the toms to rattle around on, we began sensibly with the snare and bass drum. First impressions of the snare drum were positive. Snares can be the weakest drums in a package and, as this snare is one of seven drums, our expectations weren't exactly stratospheric. However, the snare punched above its weight, giving a surprisingly consummate performance. Of particular note was the absence of buzzes and tics that so often afﬂict cheaper snares. Instead, the drum delivered a bright, clean crack that carried well. The stick response and general level of sensitivity were superb, with grace notes being reproduced with enthusiasm. Inevitably for a 5" deep drum, higher tunings were where its forte lay, but towards medium tension it still possessed a strong voice. The bass drum's vast dimensions ensured that it pushed out a deep, powerful note. PDP includes a properly sized bass drum pillow, complete with Velcro ﬁxings. Once installed, the ends of the pillow just touch both bass drum heads, nipping back overtones and rumbles without completely killing the natural resonance of the drum. Why so many other manufacturers seem unable to offer such a useful component is anybody's guess. The bass drum gave a tight, warm response and had a slightly fuzzy feel to it that was pleasing. And so we moved on to that cascade of toms and found ourselves wearing a grin for the rest of the day. The FAST sizes made the toms deceptively easy to tune, as did the fact that each step up in diameter was an even two inches. They were wonderfully quick to respond and sang clearly. Poplar is closer to birch in sonic characteristics, and the toms didn't have the same degree of warmth that you would ﬁnd in a set of maple drums. However, the ﬁtted Remo heads are all single ply and could easily be swapped for a set of pinstripes to fatten things up. As they are - punchy, resonant and harmonious - they represent a blank canvas.